The Birthday Boy Gets His Own Blog! 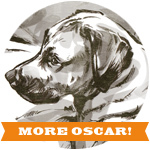 Don't worry, there's a post coming with a birthday hat and meatloaf cake, but in order to see it, you'll have to start following Oscar-dog himself - now proud owner of his very own patch of interweb! With excitment, Oscar ate my muffin launched today (and will likely change often for a while, as I tinker and fuss with a very demanding art director persistently nudging me in the elbow). Who knows where this will go, but it seemed appropriate at this point for dog lovers to have their own channel for "all Oscar, all the time", and for my science and art friends to get a relief from my periodic canine insanity (refer to the first line of this post for reference to said insanity). Whatever the case, I'm guessing it'll be a great ride. Happy Birthday, my boy - this one's for you. *The above photo - header image for the new blog - was taken by the talented Kimberly Wang of Eardog Productions.